Key note speaker: Dr Andrew Taylor, Churchill College, University of Cambridge. A list of speakers and paper titles, as well as the abstracts are now available. The event will be hosted by the Queen Mary University, London – University of Warwick IAS Classical Reception Network and the Centre for the Study of the Renaissance . Latin is the necessary working language for many early modern scholars. However, the very fact that (and the ways in which) Latin is used in the early modern period often has its own significance. 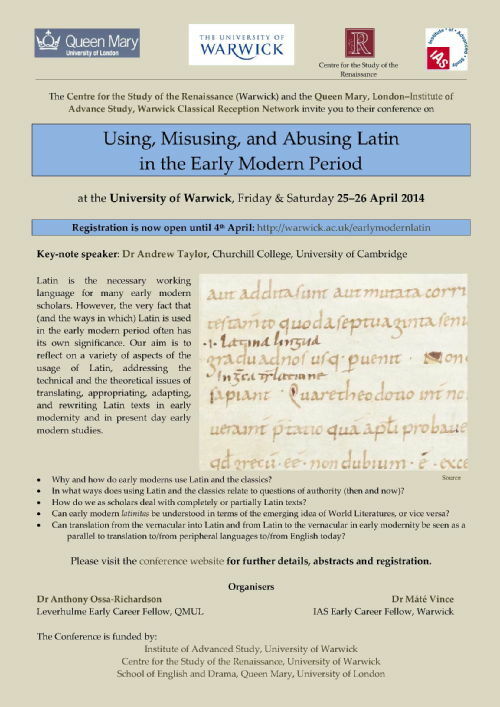 With this conference, our aim is to reflect on a variety of aspects of the usage of Latin. It will address both the technical and the theoretical issues of translating, appropriating, adapting, and rewriting Latin texts and the Classics in general in Early Modernity and in present day Early Modern studies. Why and how do early moderns use Latin and the classics? In what ways does using Latin and the classics relate to questions of authority (then and now)? How do we as scholars deal with completely or partially Latin texts: do we translate them? do we indicate differences between classical, medieval and renaissance Latin? Can early modern latinitas be understood in terms of the emerging idea of World Literatures, or vice versa? Can translation from the vernacular into Latin and from Latin to the vernacular in early modernity be seen as a parallel to translation to/from peripheral languages to/from English today? Can the issue of the circulation of literature in early modernity inform our understanding of issues of unity, diversity, and circulation of World Literatures today?